For our December SOUP we are here to look after your pre-festive sanity. 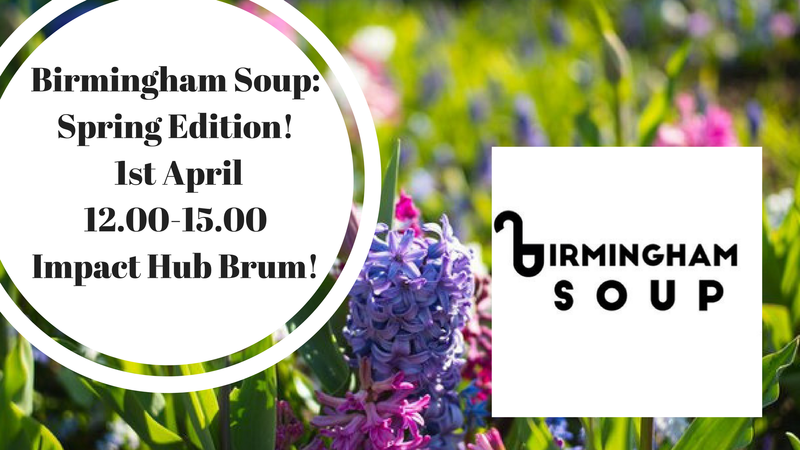 We know how it gets towards the crazy season; excess food, shopping madness, busy High Streets, bitterly cold weather and short tempers can catch the best of us out so let the calm of Brum SOUP be the antidote – here’s how to get yourself involved in next month’s all-ages event. Take a load off. The thought of another walk around the city centre, dodging the busy German Market and queuing for shopping is too much so how about investing in a new project instead? Give someone the gift of a new enterprise to start in 2017 by placing your donation on the door and voting for the project you like the most. Start 2017 with cash to help get make your project a reality. Fill out the easy, peasy application, sit back and wait to see if you are shortlisted. If you are you’ll get an email inviting you to do a 4 minute show & tell of your project idea (whatever stage you are at). The winner takes the door money so tell your friends and family to come and vote for you. With a week before Christmas we’re offering up to 10 crafters, artists and makers the chance to host their own little stall at our event and sell some items. You’ll have a captive audience of lovely folks who have turned out to support one of four people to win the Brum SOUP funding pot for December. Rather than head in to the busy High Street you can entice our guests with your lovely items and hopefully make a bit of money too. We’re looking for people from Birmingham and the local area who make their own items whether that is handmade jewellery, jars of winter chutney, scented candles, screen printed artworks, greeting cards, gifts, tote bags, clothing and accessories or homewares. Ideally they will be quality items that can be bought as gifts or as a treat. Email the info to birminghamsoup[@]gmail.com by the 5th December and we’ll let you know if you have been successful.Cost: Like all SOUP attendees and helpers, we request a donation of £5 (or more) towards the pot for the winning project. We hope to see you in December for the last SOUP of 2016. If you would like to pitch a proposal at Birmingham SOUP please take a moment to read our rules and application process on the website before submitting your form. – You can not use PowerPoint to Present your project. We DO NOT use technology to present, no powerpoint – we just hear from the people and their ideas. Each project has 5 minutes to present their idea to the dinner and could go home with all the door money to start things off! The deadline to pitch at our October SOUP is Friday 14th October 5pm. The application form is super simple – only 5 easy questions. Good luck! What a year it has been! Over the year we have held 9 SOUPs at Impact Hub Birmingham. Birmingham SOUP has been likened to real-time crowd-funding and is part of the SOUP revolution sweeping across the globe originating with Detroit SOUP. At each SOUP the audience hears the stories of four brilliant projects, who all want to make a difference to a Birmingham community, with a suggested entrance fee of £5, we’ve had a generous community of 492 attendees. At Birmingham SOUP we encourage folks to bring and share food and our lovely ladies Mel and Erin from the Bearwood Pantry have made a total of 18 Soups from food donated from local allotments or local supermarkets – flavours have included; chilled pea and mint and delicious daal, we’ve been lucky enoug to dunk delicious local bread kindly donated by Loaf, a community bakery in Stirchley. Then, after hearing the projects and eating a potluck style supper the audience cast their vote and the project with the most votes wins the money taken on the door and leaves with the funds that evening. Over the year our community of 492 attendees/investors, have given generously on the door with the average donation of £5.26. They have listened to 34 people with projects tell their story, and out of those, 9 people/projects have received seed funds totalling £2,589.95. On 20th October we invite you to our 1st Birthday party jamboree at Impact Hub Birmingham including live screen printing, music, cake, mocktails, art and SOUP in conjunction with Eye Candy, Birmingham’s own festival of visual culture. We’re pleased to be celebrating our 1st Birthday with the generous support of Eye Candy and have lots of special SOUP related goodness to share. More details to follow…. TAKE TO THE SOAPBOX AT SOUP. If you are able to bring some food or drink to share, you’ll have the option of taking to the SOUP soapbox for one minute, to share whatever you’d like with the audience. You’ll hear from four brilliant projects, who all want to make a difference to a Birmingham community, with a suggested entrance fee of £5 we encourage to bring and share food. After hearing the projects and eating a potluck style supper you cast your vote and the project with the most votes wins the money taken on the door and leaves with the funds that evening. Birmingham SOUP has been likened to real-time crowd-funding and is part of the SOUP revolution sweeping across the globe originating with Detroit SOUP. We’re pleased to be celebrating our 1st Birthday with the generous support of Eye Candy and have lots of special SOUP related goodness to share. Book in advance via Eventbrite (please note the Eventbrite booking charge of 90p per transaction) or turn up on the day with cash – all proceeds go towards the winning project.